A bar of nuts, fruit and mixed seeds with crisped rice, honey, dark chocolate and ginger. Best ever taste. Indulgent dark chocolate. High in fibre. Low in salt. Gluten and wheat free. 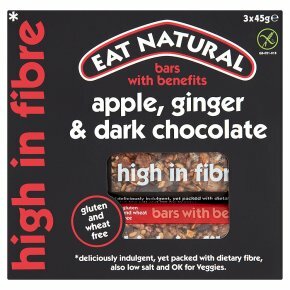 Ok for veggies.High in fibre* The ingredients in this bar have been specially chosen as they are a good source of naturally occurring fibre. Fibre has vital nutritional benefits, as part of a balanced diet and healthy lifestyle. *Deliciously indulgent, yet packed with dietary fibre, also low salt and Ok for Veggies. These bars have been specially created to give you, in our opinion, the best tasting snack you can lay your hands on. The exceptional ingredients ensure the kind of indulgence you've come to expect from Eat Natural, but by adding a little bit of our experience and know-how, we've managed to include a little extra... we call them 'bars with benefits'. So, when you take a bite, you'll be surprised by the deliciousness, amazed that it's gluten and wheat free, and delighted by the nutritional benefits of ingredients naturally high in dietary fibre.